I will never do this part justice, the first sight of land after 23 days on the ocean. Like all afternoons, today I napped. When I woke, Terry met me at the companionway and took my hand. He led me out to the front deck. And there it was. Land. A beautiful shadow of an island jetting out of all this nothingness. We did it! We actually sailed across the Pacific ocean alone and made it to French Polynesia. The beauty of Marquesas is really indescribable. The majestic mountains with the lush greenery rising out of the sea is beyond words. We arrived and anchored, we were greeted by Jackie and Luc, the two BPO reps, who showered us with 2 long bread baguettes and a sack of fruit, what a treat! 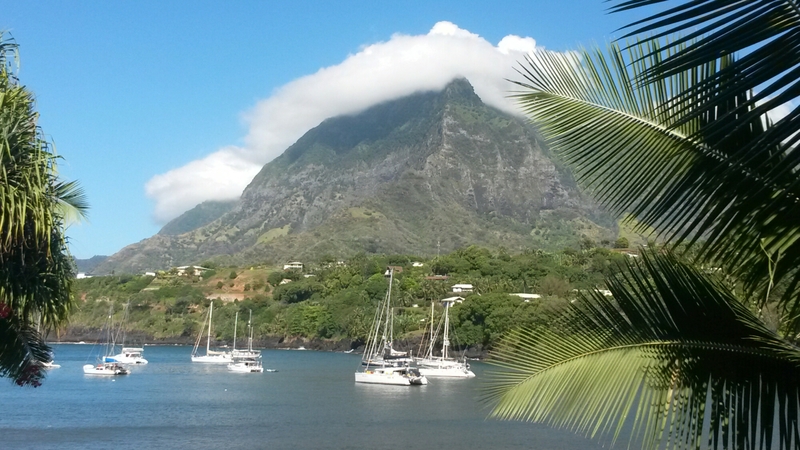 Yachts at anchor in Hiva Oa. Photo: No Regrets. On Saturday night, we went to mass at the local church. Many of the women wore flower headdresses, much like a westerner might wear a new hat to Easter service at church, although these were made especially for the occasion. The 8 foot tall crucifixion statue was decorated with a 20′ garland that must have taken many hours to complete. All the flowers come from the gardens of families from the church. There is no nursery or place where flowers are imported from. 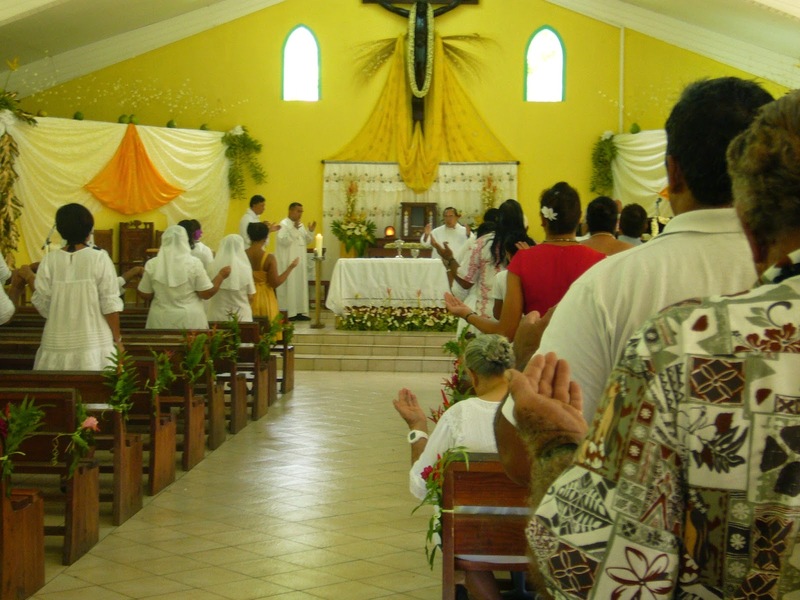 The regional bishop performed the mass, first in Marquesan, then in French. Of the 2 1/2 hour service, singing in many part harmony by the congregation was ethereal! Easter Sunday Church Service – Atuona, Hiva Oa. Photo: Maggie. Today we hired a local named Pifa to give us an all-day tour of Hiva Oa. We drove over the island to the north side. Along the way we sampled various fruits direct from the trees (Pifa’s own, or belonging to someone in his extended family). The views were spectacular. The houses were simple, but the gardens were beautiful/bountiful. It is apparent that many Marquesans are very proud of their heritage. 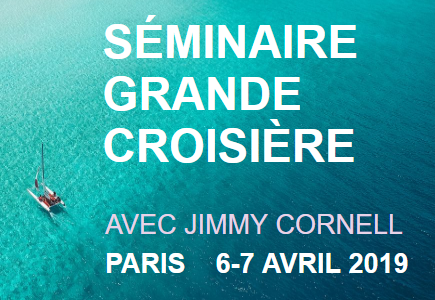 French is a second language to them, and they prefer speaking their own language. And they love their homeland. The island is spectacularly beautiful, food and water are abundant, and the weather is always good! Pifa demonstrates the bird dance. Photo: No Regrets. 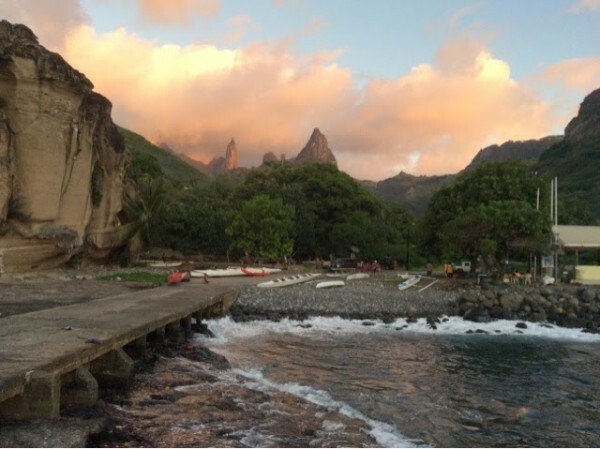 On April 3rd we picked up the hook and headed to Fatu Hiva, Marquesas. We sailed 42 miles with the wind at our nose all the while running into a couple of squalls. We actually arrived at nightfall in driving rain but were welcomed via VHF by boats that were already anchored. Lovesail and Libby made their first landfall in Fatu Hiva so I pulled together tomatoes, string beans and bananas into welcome bags for the two boats because I knew they would be out of fresh produce. As they came by to say hello, I handed out the bags and they were thrilled to have something fresh. Later, we were invited to dinner at Lovesail and proceeded to make a green salad and iced down cold beer and champagne for the dinner. Terry and Dena from Libby attended the dinner and made it a lovely evening. The champagne was opened and a toast was made to a job well done for crossing the Pacific ocean. Not many people can actually boast that they’ve made this crossing and we are three of approximately 600 boats that make the passage yearly. As the sun rose slowly, our view of the shore kept ascending and ascending to reveal that we were surrounded by huge black pinnacles rising hundreds of feet into the lightening sky. As the scene changed from smoky grey to softer, more welcoming greens and browns, we found ourselves looking onto a lush oasis of soft green grass, palm trees, a small church and a soccer field with a few houses and outbuildings nestled peacefully at the feet of eight huge monolithic cathedrals of hard, ragged stone that had withstood the erosive forces that had softened the surrounding hills into rounded, lush green dollops. The contrast was rather like the image of a kitten sleeping peacefully between the feet of an elephant. We were later joined by about 8 boats who also discovered that these impressive stone guardians of the bay formed a natural funnel that channeled winds often approaching 25 knots down into our little anchorage, more than enough to wake you up at 3 am to see if your anchor has kept you in the Bay. It is hard to imagine, when drowning in fresh fruit and visual magic, that the climate is negatively affecting this part of the world. We met cruiser Cameron the day before yesterday when exploring Faitahu. He’s obviously it given some thought. His chief recommendation is that we and any others with similar concerns continually raise the environment issues and verbally share our thoughts both among ourselves and those we meet. We don’t do enough of this and so much has to do with language barriers. I do have the feeling that the Marquesans are open to discussion. They seem very curious about us off-islanders in general. A lot has to do with our material possessions: big boats, electronic gizmos, duty free fuel, etc. On the other hand, they have some of these things and, while still entranced with all those goodies, are privy to outside news and are concerned about anything that might affect their waters, particularly fishing. This has come up repeatedly. No Regrets took along soccer balls as gifts for local kids. Cameron explains the ball is for all the kids. Photo: No Regrets. 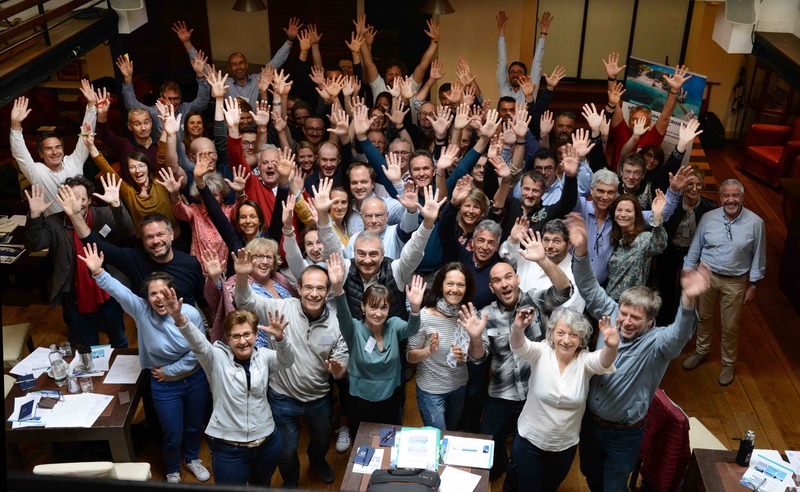 Jackie and Luc [the BPO coordinators for French Polynesia] had arranged two full days of activities with the local tourism office and the mayors of two of the towns. Ato from the tourism office and his staff, and Ben who coordinates cultural activities and his family involved many people from the community to make our visit a memorable event. The day started with a warm welcome from the people in the village. Photo: Bob on Maggie. We arrived on shore and were greeted by the locals with an amazing array of fresh fruit and bead necklaces to start our day. The group walked thru the small village and learned the history of the people, viewed a beautiful catholic church, lush gardens and the tourist center. There was a time, maybe 40 years ago, when fruit was not cool here. The companies that were importing canned and other goods pushed their wares as better than the local foods (which they suggested were for the animals). The economic hard times within the past 10 years have led to a revival of local foods. Now the Marquesans are proud of having locally organically grown fruits, harvested ripe, with no preservatives — not like what is in our supermarkets in Maine! Breadfruit tastes much like a potato and is good fried, baked, or mashed. It’s yummy fried in oil with salt, much like French fries. Marquesans are concerned as the breadfruit trees no longer produce twice a year. Extended drought has meant only one crop of breadfruit every nine months. This primary staple has been threatened by climate change. The next day’s activities were to take place in the next village, about four miles west. We motored the boat to their bay, anchored, and headed ashore. The locals waved to us, indicating that we should bring the dinghy to the “beach” — nothing but watermelon-size rocks with crashing waves. No way! We managed to tie the dinghy off a pier, despite surging waves coming in. Most of the rest of our rally crowd came by car from the first bay. The locals then wished to formally welcome our group. We walked 100 yards up the road, to be out of sight, so we could then approach as a group from away. They blared horns and shouted and chanted. As we got close they formed two lines, which we were to walk between in single file. The mayor welcomed us. The tribal chief welcomed us. And then there was some serious dancing by nearly-naked men, to welcome us. Next the males in our group were to join the men and dance with them. Drawing upon our warrior spirit, this was cool, though we generated a lot of laughing among the children present! 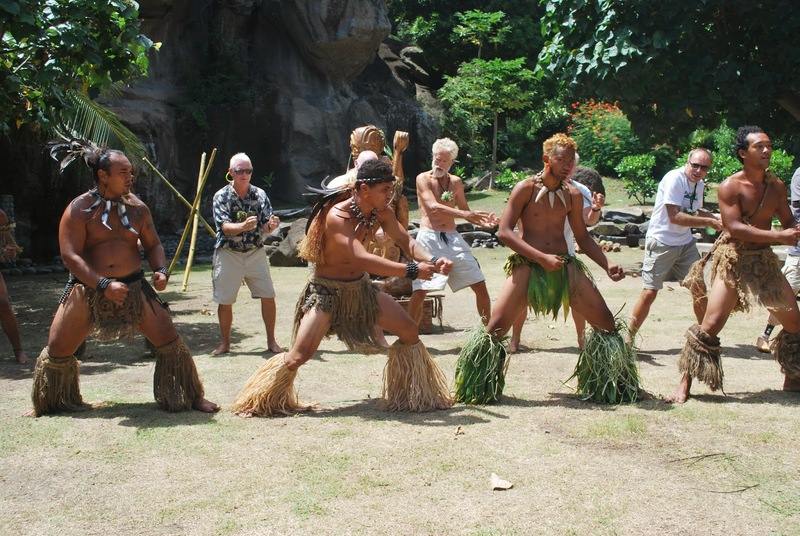 Marquesan dancing is known for having remained untainted by the tourism industry. The dancers who performed for us still perform these dances at traditional festivals today. They are not professionals nor have they changed the dancing to please the tourism industry. Historically, the focus in dancing was on war. The warriors would sound the horn, a call to war, and then would gather together to do a fierce dance for the gods. The women usually danced to commemorate the goddesses in their ancient mythology. The music is comprised of intense drumming, chanting, and singing, both men and women. 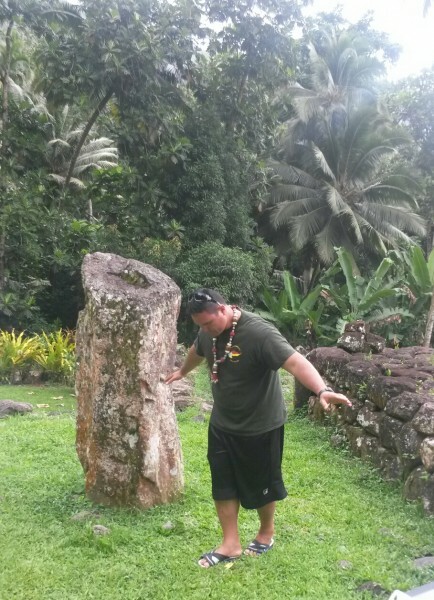 The women and men wear patches of real grasses on their bodies, no leis. The men don grass headdresses, animal teeth necklaces, and goat skulls. They look pretty darn fierce! The women do NOT shake their hips! Instead, they dance on their toes like ballerinas and gracefully glide as they moves their arms in symbolic formations! If there was a theme it might have been that of the warrior and their bodily and spiritual presence. If there is a word for it in Marquesan it would be translated into testosterone. All you true male-loving folks missed out on a series of war, mating, conquering dances performed to the rhythm of a goat skin covered drum in an amphitheater of basalt cliffs and lighted by a forest of kerosene lit torches. I wish I had words to describe this truly soul (and nether region) rattling fantasia. Sailors joining in the dance. Photo: Maggie. After the dances we headed over to the food pit. 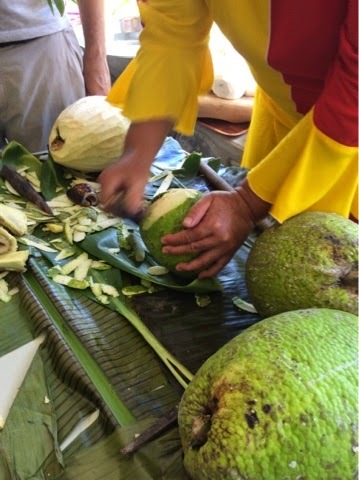 Earlier that day, the locals had layered hot coconut shells and banana leaves with meat, breadfruit, and other delectable that we have no idea what category to put them in. We watched them peel apart the layers and then walk the piping hot food to the tables in a ceremonial kind of way. 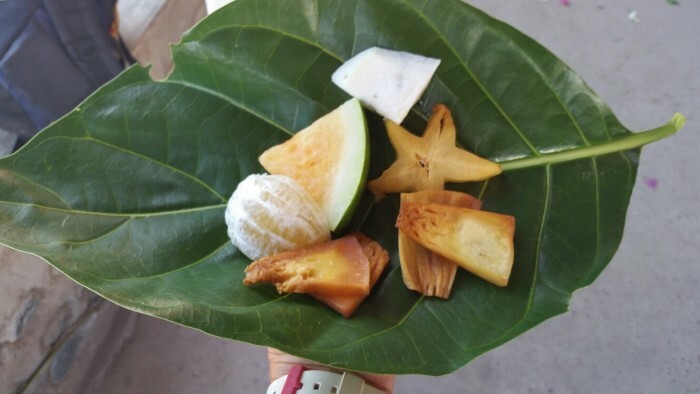 An amazing spread of fresh fruit from their gardens, served on a banana leaf with a stick for a fork. Photo: Chapter Two. It amused some of us that the said super beautiful male gods accomplished their pit emptying task through the use of smart phones employing some sort of flash light app. Incidentally, we aboard No Regrets occasionally use this contrivance to get into the boat in the darkness when we lock it with our combination device. So ended our two jam-packed days in Ua Pou. I don’t know what to make of it all; it was a lot to digest (both figuratively and literally). I’m grateful and honored (and exhausted) to have been a part of it. We’re told that the town had never put on such an event before. And the end of the day was beautiful. Photo: Heron Reach. Our last full day was spent on an island tour. We crossed the mountains through the Taipivai valley to the SE bays, then over to the NE and Hatiheu Bay. Herman Melville’s first book, Typee, is loosely based on his time hiding out in Taipivai after “jumping ship” with another crew member. One part of the tour was a lesson on botany. Although the islands had only lichen and ferns when first discovered they have good soil and climate so introduced plants from many other countries have done well. We also saw many examples of introduced species that have caused more problems than help. Without distinct seasons the buds, flowers and fruit are all on the tree at the same time. 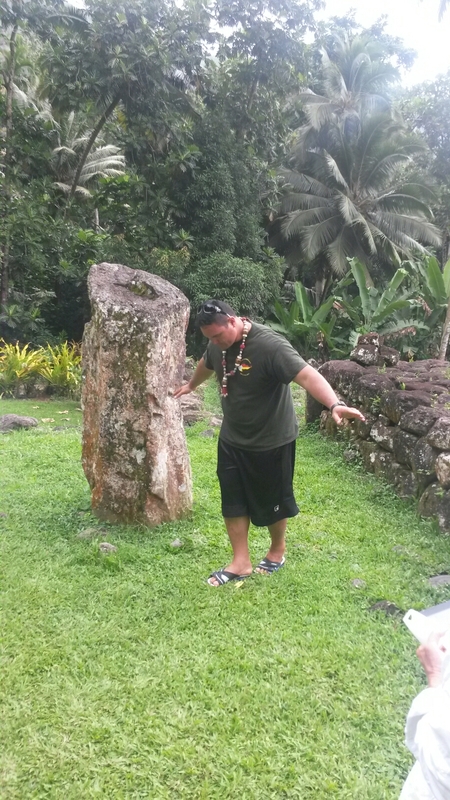 A major tourist attraction on the islands are the “tikis” which are large statues carved in stone that were worshipped as gods. We visited one large ceremonial area that had many preserved. When the missionaries arrived many were destroyed or hidden. It has only been in the last 25 years or so that the church has allowed sites to be restored for historical interest. The islanders are predominantly Christian but see the value now of knowing their past. 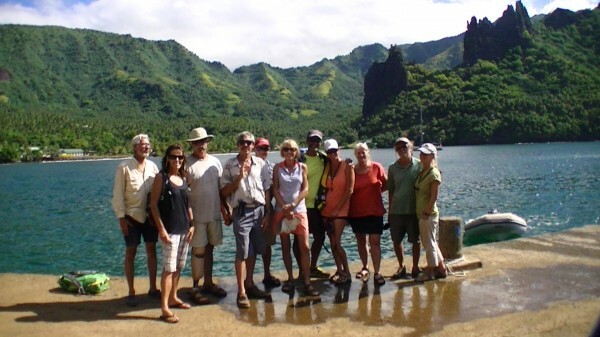 Some of the sailors go on the island tour of Nuku Hiva. Baie D’Anaho is home to an abundant population of Manta Rays whose wing span can reach 6 feet. If you are in the water at the right time and they are in the right mood, it is like swimming with massive puppy dogs. They swim around you, over you and under you in a most playful manner. They don’t seem the least concerned about your presence in their water and actually like to look at us as much as we like to look at them. Some boats have already departed for other islands, but those of us who stayed were treated to the most fun night on the rally so far. Jackie, Luc, and the locals organized a farewell buffet and traditional dancing. We had a blast and ended up dancing with the dancers!!!! Also: an account of the BPO and PO’s sailors’ meetings with local teachers and schoolchildren.